Codex 65 is an extremely valuable manuscript from the first half of the 12th century, specially important not only from a historic, paleographic, liturgical and artistic point of view, but because it has a complete repertory of Gregorian chant and deals with the history of music, theater, miniature production, medicine, agriculture and the esoteric sciences. The Codex has been described as one of the first encyclopedias of Western Europe in the 12th century. It is called Codex 65 because in the library of the Archives of the Cathedral of Piacenza it occupies the 65th place in the order of volumes placed and numbered by size. The Codex is also known as Codice Magno, Liber Magistri, Il Libro del Maestro, Codice Magnifico, Liber Officiorum and Pia 65 (an abbreviation of the title Piacenza, Biblioteca Capitolare C. 65). Liber Magistri and Codice Magno are the two titles quoted or applied most often by modern scholars with references to ancient identifications of the manuscript. Musicologists, on the other hand, seem to prefer Liber Officiorum since the manuscript contains the entire repertory of chants for the celebration of the mass and the divine office which were the ritual core of the general medieval search of God. 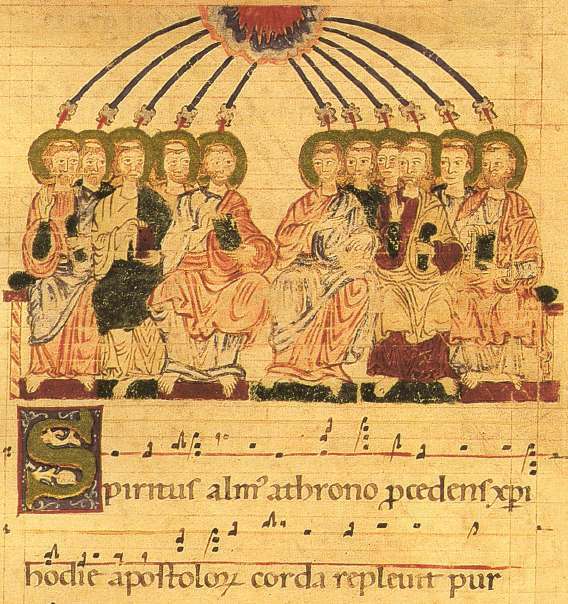 The music is written in the diastematic notation technique developed by Guido of Arezzo around 1030. Concerning the provenance of the Codex, the general consensus seems to maintain that it was written in Piacenza for the liturgy of the cathedral and probably in the scriptorium belonging to the school of the church. The main purpose of Codex 65 was to provide the necessary materials for the celebration of the solemn episcopal liturgy. The material was used by the "Magister Scholarum", one of the 18 canons of the cathedral which had a highly cultural agenda. The work of the Master demanded not only the knowledge of the rite's rubric and music for the choral parts, but the knowledge of the rite's sense in itself, its genesis, its meaning in the Scriptures and in the general traditions of the church, specially those of Piacenza. In addition to this a knowledge of astronomy was indispensable, not only for the placement of the Easter dates and all those feasts that changed their dates according to the lunar cycle, but for those of historical character which were crucial for the proper order of the holidays affected by the solar cycle, i.e. Advent and Nativity. The Codex may be seen as a splendid testimony of the practice and artistic levels in the scriptorium of the cathedral school. Naturally, for the arcane union that the Middle Ages recognized between nature and ritual, between religious celebrations, the passage of time and like, the "Master Scholarum" could not ignore the rituals of the sowing and harvest and the selection of medicinal herbs and their healthy merits for humans, plants and animals. Calendar (fols.5-30v): Here an ecclesiastical calendar provides compendiums of astrology, astronomy, medicine, agronomy and meteorology. In addition there are illustrations of the Zodiac, the solar cycle, lunar and solar eclipses, the hemispheres, the earth, stars and planets, the computations of the moon, the Easter season, the lunar months and the regular calendar year. It gives instructions for the sowing and harvest seasons, the ripening of the fruit and the breeding of animals. providing music for those parts sung by the choir. Graduale Placentinum (fols.149-261v): This section commences with a tonary followed by the chants for the Mass (fols. 151v-226). On fols. 228v-253v we have a development of 24 tropes, early stages of sacred representations and 26 sequences, poetic compositions from the 10th c.
Antiphonarium Placentinum (fols.262-439v): Musical-theoretical compilations have been copied on fols. 262-268; the treatises bring together both ancient and modern knowledge on instruments and their use, tones and execution, and form the background for the performance of a repertoire that is acknowledged by all scholars of the Codex as one of great religious and artistic importance. All the chants for the Office follow on fols. 268v-439v, ending with the corresponding Temporale, Sanctorale and Communia Sanctorum. Calendarium-Obituarium (fols. 440-445v): The closing part of the Codex, the Obituary, is a calendar listing the benefactors of the Cathedral and is particularly important since it allows us to date the Codex and to explain its genesis. We find here an entry dated May 1142 that reads: "Mor° Ribaldo, Canon of this Church and Cardinal of S. Anastasia donated his lands of Pradegio for the publication of books". We also read here that another benefactor, Maria Campanaria, bequeathed the gold required for the illuminations of the manuscript. The miniatures and illuminated initials, adorned with her gold, form a very eye-catching and intriguing feature of the Codex; still needed is a thorough analysis of the feasts illustrated and an interpretation of the relation and interaction between the chosen motives of the miniatures and the contents of the illustrated texts. It has been suggested that the Master of Codex 65 was the Canon Giovanni who was remembered as the protagonist of a historical episode by Campi e Poggiali in 1129. In the obituary of the Codex his death is recorded on February 2, 1148. Scholarly research on the Codex seems to have exploded in the last decade. Though it is the most precious liturgical manuscript in Piacenza and quite outstanding among the medieval liturgical books in Northern Italy, it seems somewhat surprising that this manuscript had not been shown in public before the successful exhibition in the Museo Civico in Piacenza (December 1993 - April 1994). In March 1997, it was exhibited in connection with the international symposium on the Piacentinian Liber Magistri, and now at last, the entire Piacenza, Biblioteca Capitolare C. 65 will be accessible to scholars in this tremendous facsimile edition. 904 pp, reproduced in 4-5 colors plus bronze, applied by hand. Measurements (after the original): 34 x 51 cm. Limited edition of 450 copies, handbound in leather over thick wood boards with brass closures. Commentary (273 pp, in Italian/English) by Brian Møller Jensen. Price on request.